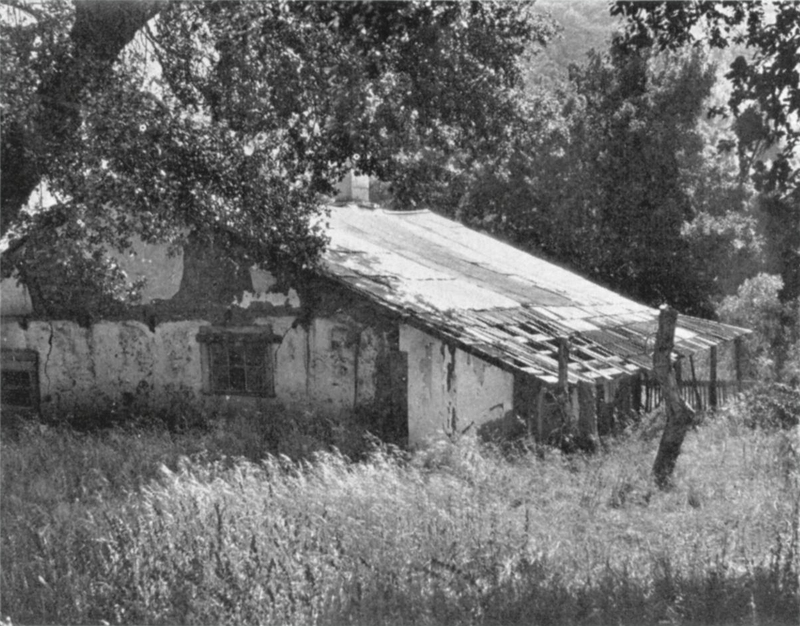 SCVHistory.com | Tejon Ranch | E.F. Beale's Rancho La Liebre (Parks 1929). E.F. Beale's Rancho La Liebre. Memories of Jose Jesus López. Excerpt from "In Pursuit of Vanished Days: Visits to the Extant Historic Adobe Houses of Los Angeles County" by Marion Parks. Historical Society of Southern California Annual | Vol. 14 No 2, 1929. "The last adobe remaining in San Francisquito Cañon. It was Major (Gordon's) stage post." Click to enlarge. The rancho of the hare or jack-rabbit was the southernmost of a great quartette of mountain ranchos founded by General E.F. Beale, with headquarters at El Tejon — the rancho of the badger — during the vigorous campaigner's life in California. La Liebre had been granted in 1846 to Jose Maria Flores, commanding officer in the last stand of the Californians against Stockton and Kearney at La Mesa. From him it was conveyed to Beale. In the day of that energetic military administrator 25,000 cattle roamed the four great ranchos, Castaic, Los Alamos, El Tejon and La Liebre. And when Beale was in partnership with Colonel Baker the number of sheep on the rancho is said to have exceeded 100,000. In those days feed was more plentiful on the range, which extended unbroken, up the great San Joaquin Valley all the way to San Francisco. Without a fence to stay them, the cattle were driven periodically to the north and sold. According to the recollection of J.J. López, mayordomo of the Beale ranches for fifty years, it was just at the close of one of these long drives that the partnership of Beale with Colonel Baker began. Beale had sold 6,000 cattle from Rancho La Liebre to Henry Miller. He was preparing to stock 'the ranch again when he met Colonel Baker, probably at Fort Tejon. Baker had brought his sheep over the mountains in an effort to save them during the drouth of 1864. Their meeting resulted in a partnership whereby the two men raised sheep together there for seven years. In 1870 they divided the flocks between them, Beale remaining with his portion at the mountain ranchos, while Baker drove his flocks back out of the mountains, across San Fernando Valley and the ranches where Hollywood and Beverly are today, to Rancho San Vicente y Santa Monica, on the coast. Tucked away in a little cañon where Antelope Valley meets "the Ridge," on the valley floor just off the dirt road which runs between the Ridge Route and Elizabeth Lake, stands the adobe built by General Beale to serve as headquarters for the ranch of the jack rabbit, back in the very early sixties. On the patent map of 1862 the house is shown, and the little cañon ascending into the rugged mountains behind it is called "Cañon de las Osas" — the cañon of the she-bears. Near it also is indicated a "fine spring," while at the top of the cañon a "large spring" is shown as well. Many years ago Vasquez' trail led through these mountains, and he often camped near these splendid natural springs, one of which may still be seen near the old house, with the clear water boiling endlessly up out of white gravel. The adobe house is commodious, well designed and strongly built, suggesting the efficient management and thoroughness which characterized Beale. It is said that the General lived there himself for two or three years while he was Surveyor-General. 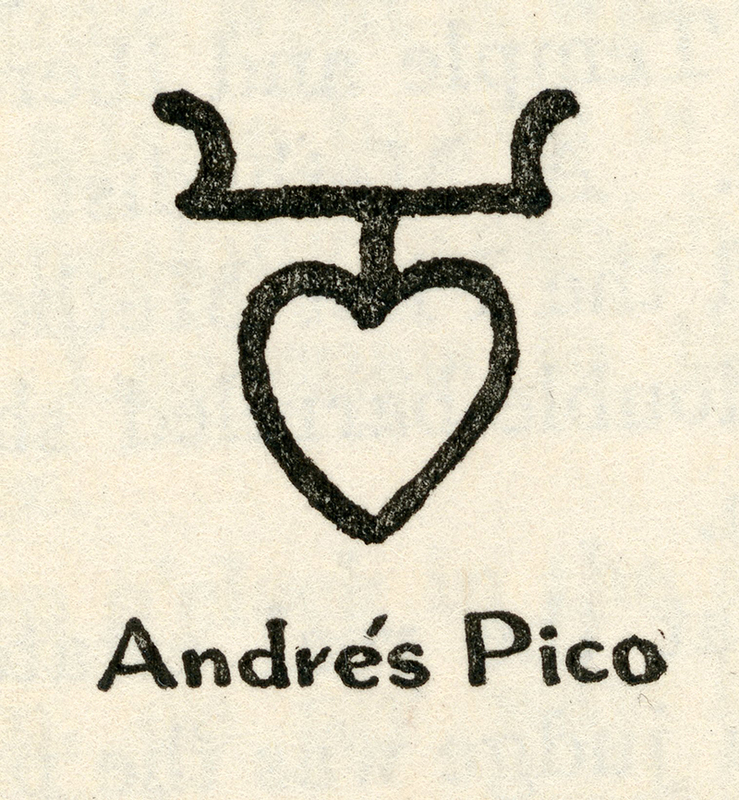 Andres Pico's brand. From Horace Bell: "On the Old West Coast" (1930). We don't know what Rómulo's brand looked like. Click to enlarge. About 1874, Beale gave Rómolo Pico permission to bring his cattle and horses to La Liebre to range. Thus the brands of both Rómolo and Andres Pico were seen in these hills for several years, and the rancho and the adobe house became identified with Don Rómulo. W.W. Hudson was Beale's first superintendent at Rancho La Liebre, and Francisco Acuña, whose body lies in a lonely grave at the head of the garden at Rancho El Tejon headquarters, was the first cattle mayordomo of the four ranchos. Then in 1876 came Don Jose Jesus López, who now looks back upon fifty eventful years as mayordomo, for General Beale, then for his son Truxton, and twelve years more for the El Tejon Rancho Company, present owners. His story is most interesting, vivid and crowded with memories of many years and tremendous changes. "When I was about seven," he tells, "my father (Gerónimo López) moved from Paredón Blanco to San Fernando. In those old days there were only two roads from Paredón, one to Los Nietos, and one out to the Lugo's. "I went to school at St. Vincent's College in 1866. Then my father sent me to a Spanish military school at Los Angeles. I went one year. It was Silva's Escuela Normal. "Then my father objected. He said, 'I have given you a good education. Now do you think I want you to go herd sheep?' But Tio Chico persuaded me. He got me credit with General Beale's house at El Tejon, although I never made use of it, and he gave me three years to pay for the sheep. He helped me to make a man of myself, and if I have anything today I owe it to him. "So I came up into this country when I was twenty-one years old. "Black bears were numerous in the mountains then, and antelope were seen on the plains. There would be bands of two or three hundred — no, more than that — a thousand! They roamed the desert, and looked like herds of cattle or horses in the distance. We would see them coming down for water. I saw many of them in 1875 and '76, and they were there until about 1880. But then they began to disappear. I don't know what happened to them. It doesn't seem as though they all could have been shot. On La Liebre the plain used to be full of them, and up to three years ago there was still a band of some fourteen there. For years and years there was a little band of eight near the Grape Vine cañon, but the settlers, of course, have shot them. "We were not bothered with coyotes, although there were plenty of them. Once in a while a coyote might kill a lamb, but they preyed mostly on the ground squirrels. "There was plenty of feed and no fences, in those days. One time I drove 7,000 wethers to Los Baños. I was 40 days on the road." A Decaying Adobe on "The Ridge"
Out of the monotonous though fascinating scenery of the Ridge Route the broken form of this wistful and forgotten place has often challenged my attention, as I have looked down upon it from the highway where it passes Bailey's Ranch. When I asked him, Don Jose Jesus remembered it and laughed. "I used to own it," he said. "The first locator in that cañon was a man named Bartolo Delcid, a Mexican. That was way back in 1879; he was mining there. He was living in Bakersfield later, and one day about 1884 or 1885 he came to me and said, 'Mr. López, my family has grown so large I haven't room enough for them. I would like to make an adobe house, and I want to borrow $500.' I told him his land wasn't worth that, and he said, 'Well, how much can you lend?' I told him $200, and he gave me a mortgage on that land on the Ridge. "He was building that house for a long time. And after he had it all completed his family wouldn't stay there. The girls had all grown up, and they wanted to live in town. That family never remained in the adobe one day. So he came back to me, and he said, 'Mr. López, I can't pay you that money. You better take the ranch. My family won't stay.'" So ends the saga of another adobe. The date is in the 1880's. Adobe days are passing, and even the native daughters have begun to pine for millwork and turrets.